Sadly, this picture doesn’t include my camping gear, firearms, or boating equipment. We do one of two things when it comes to buying sporting good equipment. We either go all out and buy the most expensive gear, including matching clothes after trying the sport once. Or, we beg, borrow, or buy the cheapest stuff available. Either way, we’re in for some problems. Those of us who must have the best and need to have it now all have garages, attics, or closets filled with sporting equipment we don’t use. There’s the bicycle from that triathlon you were going to do but then your running buddy got pregnant, not to mention the clip-in shoes that the salesman swore would decrease your time. Now they’re collecting dust and you don’t want to sell it because that would be giving up on your dream to compete (and admitting your spouse was right). On the other extreme are the cheapskates among us who refuse to buy new or expensive equipment because it’s not like they’re pro. The last skis you bought were in the seventies when you got that snazzy one-piece snowsuit thrown in for paying cash. Your skis stand a foot above your head and often hear the comment on the lift, “You ski on those?” But after all, you reason, hundred-dollar skis get you to the same place as thousand-dollar skis. I’ve made both of these mistakes in my life. The first skis I bought, I picked up at a garage sale for $15, my boots at a swap for $5. My instructor wouldn’t let me ski until he took me into the rental shop to get a wax on them. He told me to get the rust edged off before I came for another lesson. They were too skinny, too long, and too stiff for a person of my ability level. I spent the season at the back of my class, struggling to keep up on basic greens. If I hadn’t found a pair of beginner skis for $100 at a ski swap the next winter, I probably would’ve given up the sport for good. 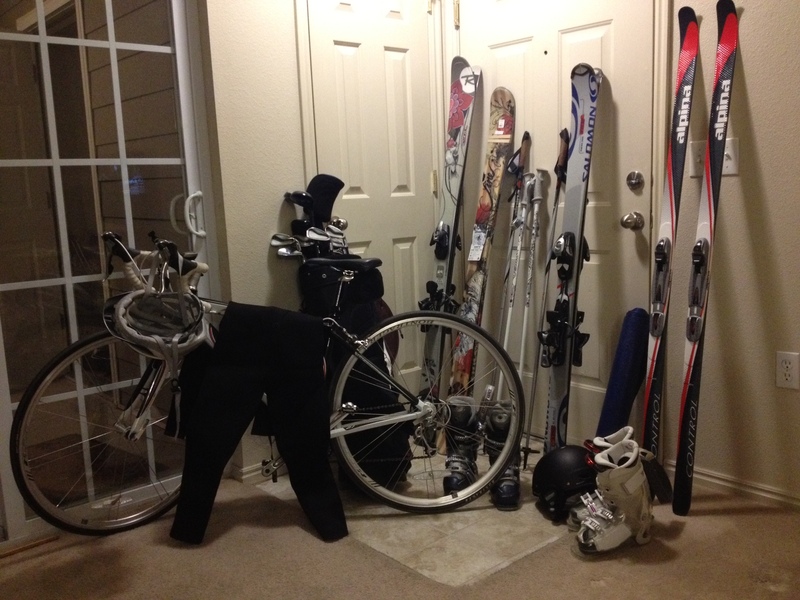 Then the season before last, I lost a pair of skis (turns out if you leave your skis in the resort parking lot, they’re gone for good). I became obsessed with a certain set of skis, which after demoing for one hour, I was determined to own. No shop in Utah had them, so I ordered them special from California for way too much money. But I decided the “right” ski was worth it. The skis were taller than I was used to, but all the “experts” said that since the skis were rockered that wouldn’t be a problem. After buying them and trying to ski on varied terrain, it was a problem. Turns out rockered skis should be on average 5 to 6 centimeters longer than what you’re used to. Unfortunately my new skis were 14 centimeters longer. I had to punch the brakes on anything steep and couldn’t get out of my backseat. I fought all season before admitting defeat when I realized that hills I had skied with ease now challenged me. I learned my lesson. I went to Christy’s at Deer Valley and paid the demo fee to try out different skis. Christy’s is right next to the mountain base and for the price of one daily demo, you can take out different skis all day long. It was an eye-opening experience for me to feel the difference between skis of different brands and slightly different sizes. One ski would have me charging down steeper stuff and the next, crawling down an easy blue. What I’ve learned from my experiences is to not buy the cheapest nor the most expensive, instead buy what works for you. Don’t let a salesman pressure you into a decision you’re not ready to make and always give any big purchases thought. You don’t want to end up with a bunch of gear you don’t need because you didn’t know better. If you’re just starting a sport or wanting to try a new one, find out where you can rent or borrow the equipment. Go a few times to ensure that this is something your committed to and not some passing fancy like when you were totally going to take up rock climbing but then realized after you bought the gear and went once, you hate heights. Take lessons or go with experienced friends and ask them what you really need to participate. You can ride a bike in jogging clothes, no one will mock you.